Why Be Curious? 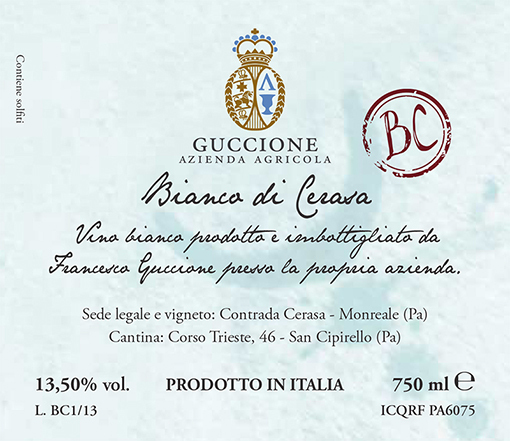 ‘BC’ stands for ‘Bianco di Cerasa’, Guccione’s white blend. Cantina / Cellar: Fermentation with native yeasts, including few days of skin contact, in a combination of stainless steel tanks and 3000-liter tini (large, upright wooden casks). A year of aging in the same combination of stainless steel and tini. No filtering or clarification. Ettari / Hectares: 3.8 ha. Vitigni / Varieties: Trebbiano and Catarratto. Età delle viti / Vine age: About 30 years old for Trebbiano and 10 years for Catarratto. Allevamento / Trellis system: Tendone (overhead trellis, or pergola) and spalliera (vertical trellis). Resa / Yield: 4000 / 4500 kilograms / hectare. Fermentazione alcolica / Alcoholic fermentation: Spontaneous, with few days of skin contact, in a combination of stainless steel and 3000-liter tini (large, upright wooden casks). Zolfo / Sulphur: 48 mg/L total, 12 mg/L free. Produzione annua / Annual production: Usually 4,000 bottles, in cases of 6 bottles each.